This article is about the former airfield in Berkshire. 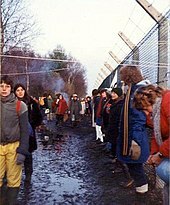 For the anti-nuclear protest that took place there, see Greenham Common Women's Peace Camp. Opened in 1942, it was used by both the Royal Air Force and United States Army Air Forces during the Second World War and the United States Air Force during the Cold War, also as a base for nuclear weapons. After the Cold War ended, it was closed in September 1992. The airfield was also known for the Greenham Common Women's Peace Camp held outside its gates in the 1980s in protest against the stationing of cruise missiles on the base. In 1997 Greenham Common was designated as public parkland, effectively returning it to its pre-WW2 status but with restrictions. The common was made a site of site of Special Scientific Interest (SSSI) in 1985 along with Crookham Common. The Cold War era control tower has recently been redeveloped and is now open as a visitor centre and cafe. 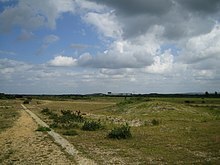 Before the building of an airfield, Greenham Common was a massive piece of common land. It was used for troop movements during the English Civil War and in the eighteen and nineteenth centuries. In late 1943, Greenham Common airfield was turned over to the USAAF Ninth Air Force. An American advance party soon arrived to ready the airfield for the incoming units. Greenham Common was known as USAAF Station AAF-486 for security reasons by the USAAF during the war, and it was referred to by this name instead of by location. Its USAAF Station Code was "GC". The first arrival was the 51st Troop Carrier Wing Headquarters, arriving in September 1942. The 51st TCW controlled the three troop carrier groups at RAF Keevil (62nd TCG), RAF Aldermaston (60th TCG) and RAF Ramsbury (64th TCG) as part of Twelfth Air Force. The Wing Headquarters was located in requisitioned Bowdown House, a mansion on the northeast end of the airfield, and made use of the runways for its communication and courier flights. The 51st TCW HQ followed its groups to North Africa as part of Operation Torch in November 1942. On 4 November the 354th Fighter Group arrived from Portland Army Air Field, Oregon and they were informed they were to fly the North American P-51 Mustang. This was a change of equipment for the group, as they had trained with Bell P-39 Airacobras. The group stayed at Greenham Common for only a few days, being transferred to RAF Boxted in Essex on 13 November. The 368th was a group of Ninth Air Force's 71st Fighter Wing, IX Tactical Air Command. The 368th FG moved to RAF Chilbolton the next day. 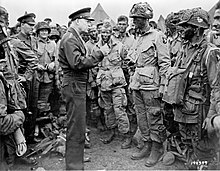 General Dwight D. Eisenhower addresses Company E, 502nd Parachute Infantry Regiment (Strike), at Greenham Common Airfield about 8:30 pm on 5 June 1944. The 438th was a group of Ninth Air Force's 53rd Troop Carrier Wing of IX Troop Carrier Command. The 90th TCS stayed in the UK and operated from RAF Welford until the rest of the groups aircraft returned from Italy on 24 August. In the absence of the 438th, the 316th Troop Carrier Group used Greenham Common as a forward base. The airfield was inactive for the next five years, and would probably have remained so but for the sudden escalation in tension between the Soviet Union and its Second World War Allies in what later became known as the Cold War. After the 1948 Berlin Blockade and the 1950 invasion of South Korea by the Korean People's Army, the perceived threat from the Soviet Union rose. On 23 April 1951, RAF Greenham Common was made available to the United States Air Force by the British Ministry of Defence as a Strategic Air Command base, with joint operations with the Royal Air Force units. Formal handover to the 7th Air Division was on June 18 and massive reconstruction work began. Basically, the entire wartime airfield was demolished and replaced with a new 10,000 ft (3048 m) east/west runway with parallel taxiways north and south of it leading to extensive hardstandings. A new technical and domestic site was built to the south of the runway, involving diversion of the A339 road and demolition of several homes and two pubs. Construction work was finally completed and the base declared operational in September 1953. USAF Boeing B-47E-50-LM Stratojet, AF Ser. No. 52-3363, in flight. In the post-Second World War years, the United States Strategic Air Command was based at three major airfields in eastern England: RAF Lakenheath, RAF Marham and RAF Sculthorpe. The increasing tension of the Cold War led to a re-evaluation of these deployments and a move further west, behind RAF fighter forces, to RAF Greenham Common, RAF Brize Norton, RAF Upper Heyford and RAF Fairford. In April 1958 the 90-day detachments were replaced by a three-week Reflex Alert rotation, during which the bombers did not fly, reducing the noise considerably. The runways and dispersals were further strengthened for the Boeing B-52 Stratofortress bomber, but none were based at Greenham. 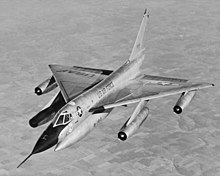 From August 1960 the B-52 made periodic training visits, and a Convair B-58 Hustler arrived briefly in October 1963. Reflex operations by B-47 and KC-97s continued until 1 April 1964. The Strategic Air Command (SAC) departed Greenham Common on 30 June 1964, much to the relief of the local residents; the thundering jet bombers of SAC came no more, and for several years it was used for USAF storage and as a relief base. The closure of US bases in France forced the reopening of RAF Greenham Common for air transport operations (Operation FRELOC) to handle materiel and personnel overflow beginning in early January 1967. In late 1967, Greenham Common was used for NATO Exercise REFORGER, again as a result of the withdrawal of France from the NATO integrated military alliance. On 1 November 1968 control of RAF Greenham Common was transferred from SAC to the United States Air Forces in Europe, with the 7551st Combat Support Group having administrative control of the base. However, the base was little used, primarily being utilised as a United States Military Postal Mail sorting facility, with aircraft flying mail in from the United States, being sorted at Greenham Common, then distributed to American bases in the UK and Europe. Mail from American forces in Europe was also sent to Greenham Common and sorted there, before being flown to the United States. Beginning in 1973 the base became the home of the International Air Tattoo, a large scale international military airshow, since relocated to RAF Fairford, approximately 40 miles (64 km) away. The 20th Tactical Fighter Wing at RAF Upper Heyford established "Operating Location A" at Greenham Common for its F-111 fighters in 1976, using the airfield occasionally for dispersal exercises. In 1977 the USAF announced plans to reactivate the base to house KC-135 aerial refueling tanker aircraft, due to a lack of capacity at the KC-135's main base in Britain, RAF Mildenhall. This led to widespread local opposition, and in 1978 the British Defence Secretary vetoed the plan. To deploy in Europe from 1983 up to 464 USAF BGM-109G Ground Launched Cruise Missiles or GLCMs, as well as 108 US Army Pershing II ballistic missiles. (See also SLCM and ALCM). The UK's share of this total was 160 missiles, 96 based at Greenham Common with four spares, and 64 at RAF Molesworth. When in June 1980 it was announced that RAF Greenham Common was to become the first site for cruise missiles, there was an outcry from the Campaign for Nuclear Disarmament. Once more a massive new construction was undertaken as the GLCM Alert and Maintenance Area (GAMA) site was built in the southwest corner of the base. GAMA was a maximum security QRA (Quick Reaction Alert) area with 6 large above ground shelters in which fully operational cruise missiles were stored. Each shelter contained 2 LCC Launch Control Centers and 4 TEL transporter erector launchers. Units were mobile and, once deployed, would travel from the base in convoys to secret preset dispersal sites. This would happen within minutes of the alert being given; movement was via local roads through the surrounding villages. The first squadron of the 501st Tactical Missile Wing received its weapons in November 1983; they were flown onto the base by Lockheed C-5 Galaxys. A series of meetings held during August and September 1986 culminated in a summit between United States President Ronald Reagan and the General Secretary of the CPSU Mikhail Gorbachev in Reykjavík, Iceland, on 11 October 1986. To the surprise of both men's advisers, the two agreed in principle to removing INF systems from Europe and to equal global limits of 100 INF missile warheads. The United States and the Soviet Union signed the Intermediate-Range Nuclear Forces Treaty in 1987, which led to the removal of all nuclear missiles from the base. The last GLCMs at RAF Greenham Common were removed in March 1991, and the 501st TMW inactivated on 4 June 1991. The base's last operational commander, Group Captain Andrew Brookes, RAF went on to become an aviation author and defence academic. From 1981 "women's peace camps" were established in protest at the deployment of cruise missiles. They came to be known as "The Greenham Women" or "peace women", and their 19-year protest drew worldwide media and public attention, often due to the peace women cutting through the fences of the base. On 11 September 1992, the USAF returned RAF Greenham Common to the Ministry of Defence. On 9 February 1993 the Greenham Common air base was declared surplus to requirements by the Secretary of State for Defence and the facility was closed and put up for sale. On 28 February 1958, a B-47E of the 310th Bomb Wing developed problems shortly after takeoff and jettisoned its two 1,700 gallon external fuel tanks. They missed their designated safe impact area, and one hit a hangar while the other struck the ground 65 feet (20 m) behind a parked B-47E. The parked plane, which was fuelled, had a pilot on board, and was carrying a 1.1 megaton (4.6 PJ) B28 nuclear bomb, was engulfed by flames. The conflagration took sixteen hours and over a million gallons of water to extinguish, partly because of the magnesium alloys used in the aircraft. Although two men were killed and eight injured, the US and UK governments kept the accident secret: as late as 1985, the British government claimed that a taxiing aircraft had struck a parked one and that no fire was involved. Two scientists, F. H. Cripps and A. Stimson, who both worked for the Atomic Weapons Research Establishment at Aldermaston, alleged in a secret 1961 report, released by the CND in 1996, that the fire detonated the high explosives in the nuclear weapon, that plutonium and uranium oxides were spread over a wide area (foliage up to 8 mi (13 km) away was contaminated with uranium-235) and that they had discovered high concentrations of radioactive contamination around the air base. However, a radiological survey commissioned in 1997 by Newbury District Council and Basingstoke and Deane found no evidence of a nuclear accident at Greenham Common, suggesting that Cripps and Stimson's claims were false. The seven-month long survey was carried out by the Geosciences Advisory Unit of Southampton University and combined a helicopter-mounted gamma ray detector survey with a ground-based survey. The team analysed nearly 600 samples taken from soil, lake sediment, borehole water, house dust, runway tarmac and concrete, looking for uranium and plutonium isotopes. No evidence of an accident involving nuclear weapons damage was found at the former air force base although the ground survey detected some low-level uranium contamination around the Atomic Weapons Establishment at Aldermaston thought to be derived from that facility, and the helicopter survey found some anomalies around Harwell Laboratory. An episode of BBC's Top Gear was filmed at the abandoned airfield, with Jeremy Clarkson and James May attempting to find out if communism had produced a good car. In the 1996 video game, Broken Sword: The Shadow of the Templars, Lady Piermont mentions Greenham Common after helping George Stobbart get the Templar manuscript. Greenham Common airfield was used as a filming location for the 2015 film Star Wars: The Force Awakens and 2017 film Star Wars: The Last Jedi. The GAMA area was used as the location for the above ground Resistance base on the fictional planet D'Qar. ^ "SITE NAME: GREENHAM AND CROOKHAM COMMONS" (PDF). Retrieved 19 March 2017. ^ "Star Wars surprise: Millennium Falcon and X-Wing pictured". BBC News. 10 September 2014. Retrieved 11 September 2014. 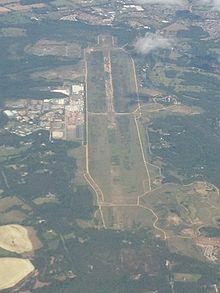 Wikimedia Commons has media related to RAF Greenham Common.